The stats indicate that Christmas shoppers tend to buy just about as much for themselves as for their giftees. I don't usually do that; but after the wrapping paper is in the trashbags and the kids go upstairs to play with all the stuff they got under the tree, I do shop for me. Often, I do it online, and this year was no different. I visited the sales at LL Bean and Land's End, and I took advantage of the end of year sale at Fictionwise. 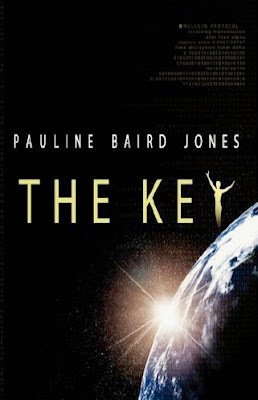 While cruising through bestsellers in Science Fiction, I came upon a real gem by Pauline Baird Jones, entitled The Key. Fighter pilot Sara Donovan crashes on a mysterious planet and is rescued by an alien who is seriously hot. The Key is not hard science fiction, nor is it a sensuous romance, but that is a plus for me. Instead, it is action-packed, often funny, and blessed with enough suspense and engaging characters to keep readers turning the pages. I enjoyed it quite a great deal, and I believe my teenaged son would also enjoy it, due to the frequent "kick their trash" battle scenes. There are a few lapses in logic, but that is all part of the fun in space opera, so if you are willing to suspend your disbelief, Jones' saga is worth your time. By far, this is the best space opera I've read since Tigra, which was my favorite entry in the genre in 2007. I read this as an eBook, but it is also available in trade paperback from Amazon. This novel further cements my belief that the most entertaining stories are not being put forth by the "big guys" in publishing. The Amazon.com price for the trade paperback is $14.93, considerably less than a book would be with my current publisher, WCP, so kudos to L&L Dreamspell, a new publisher, which printed this wonderful read at a reasonable, if not cheap, price. I recommend this book for an entertaining way to stay inside out, of the cold. Is marriage a thing of the past?